Thoughts on Solar Cooker Temperature. This simple question is a little misleading because the value of temperature alone will not reveal the cooking ability of a solar cooking device. Temperature achieved must be “weighted” by the size of the cooker. A small magnifying glass can achieve very high temperature, but is of little use for cooking. A small parabolic can achieve a very high temperature but, again, it is of little use for cooking. So a one thousand square inch cooker produces 2 times the power of a 500 square inch cooker if both achieve the same temperature. 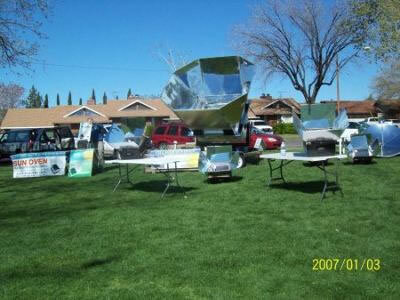 Here in California there is a very large trailer mounted solar oven. It cooks a lot of bread at one time - but it does not cook any faster than a smaller oven cooking a single loaf. The large oven and the small oven both achieve the same temperature, but the large oven has greater power because of its greater insolated area. The relationship of size to cooking power (not just temperature) is very clear. For any given design, the larger the insolated area, the greater the power. Bottom line is this: A small cooker only collects a small amount of sunlight. No matter how good the design, no matter how great the maximum achieved temperature, the small cooker is appropriate for small quantities only. If you need to cook a lot of food, use more than one cooker or use a cooker that collects more sunlight. This will definitely be very helpful to our site visitors. I too get the same "how hot" question all the time. P.S. I took the liberty of adding the definition of insolation so that people would know what it meant, and a photo of the big Villager oven. which material is used as reflector on the parabolic solar plate? Solar cooking is simple, yet must obey the laws of physics. The basic principle of the multi-reflector box cooker has not changed, nor can it. It is all about achieving maximum concentration of light onto the cook pot. Size does matter, as does design. Recently I received a photo of someone's workshop. Their scraps and cutouts, their cutting template, all straight from the plans, looked just like my cutting table. I am honored that people are building my cooker. Typed too fast...3.14159 vice 4.14159 for Pi. Often, I'll see solar ovens and burners make energy claims that seem a bit exaggerated. A BTU is the energy required to raise a pound of water, one degree Fahrenheit. Its common knowledge that a square meter above the Earth's atmosphere receives 1350W of solar energy. That equates to 4606 BTU (since 1,000 W = 3412 BTU). Taken to the next level, sea level, post atmosphere, we should see a square meter collecting 1000W of solar energy on a clear day. When I saw a 4' x 8' solar hot water panel stating that it captures an estimated 30,000 BTU, I simply check the math. 32 sq. ft. = 2.973 sq. meters x 1000 Watts (or 3412 BTU), I get 10,144 BTU, not 30,000 BTU. IF the claim had been 3,000 Watts, it would have been much more believable. I have a 1.5M parabolic dish, which will probably claim that the energy directed to the cooking surface is 1500W. Is it true? A 1.5 meter diameter is around 4.92 ft. This gives us a radius of 2.46 ft, which is squared and multiplied by 4.14159 to give us 19 sq ft of area. That's 1.76515 square meters x 3412 just over 6,000 BTU or 1765 Watts. Since the parabolic dish isn't perfectly efficient and some light escapes the focal point, I'd say this claim is very accurate. But as you rightfully pointed out, BTUs or Watts captured does not convert to any particular temperature for the food, since the color and density of the cookware, and insulation around the cookware, make a world of difference. Creating an insulation layer of air, using a polycarbonate bag, helps trap heat. Lightweight cookware like Graniteware helps put the heat into the food vice absorb the heat into the cookware. Using reflective angles to trap reflected radiant heat and light, goes a long way towards creating a higher efficiency. Positioning the cooker so that it's perpendicular to the sun, also goes a long way. All of these things, once again, leads me to believe that the boxed area created under your ASSC's (All Season Solar Cooker) reflective surfaces, and the ability to focus the sun, is the reason that cooker works so incredibly well.